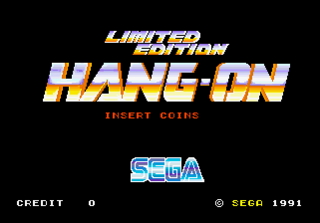 Limited Edition Hang-On is a re-released version of Super Hang-On, appearing in arcades in 1991. It runs on identical hardware to Super Hang-On and shares similar gameplay, however has new, more forgiving courses (among other things) to make the game easier. A Limited Edition Hang-On cabinet is easy to spot as it has a fully body motorcycle seen as part of the original Hang-On's cabinet, rather than those used in the original release of Super Hang-On. Limited Edition Hang-On's bike is blue and is labeled "Limited Edition", rather than the red bike used for Hang-On cabinets.